A couple of months ago, pestilence I posted a recipe for Flank Steak Stuffed with Spinach, pestilence Feta & Artichokes. It was a very pretty dish that I enjoyed thoroughly, so I thought I’d take the same idea and turn it into a full meal. And as most of you probably realize, I love pasta. Of course, I would turn that recipe into a pasta dish at my earliest opportunity. Sliced flank steak, roasted red onion, artichoke hearts, spinach and feta cheese all tossed with olive oil and pasta and baked until crisp. It’s a not typical casserole-style dish. Not super creamy or gooey, but I love the texture of the baked noodles. (Especially picking them off the top of the casserole dish when no one’s looking.) If you’re short on time, or just feeling lazy, you can definitely skip the casserole dish and the extra baking time. Either way, it’s one of those simple, delicious dishes everyone will love. Preheat your oven to 450° and season the steak with salt and pepper on both sides. Place the steak on a rimmed cookie sheet and surround it with the chopped onion. Broil the steak until medium, about 8 minutes on each side depending on the thickness of the cut. Reduce the heat to 375°. Remove the steak and let rest for 5 minutes, then slice it into thing pieces. While the steak is cooking, boil the pasta until al dente. Reserve 1/2 cup of the pasta cooking water and drain. 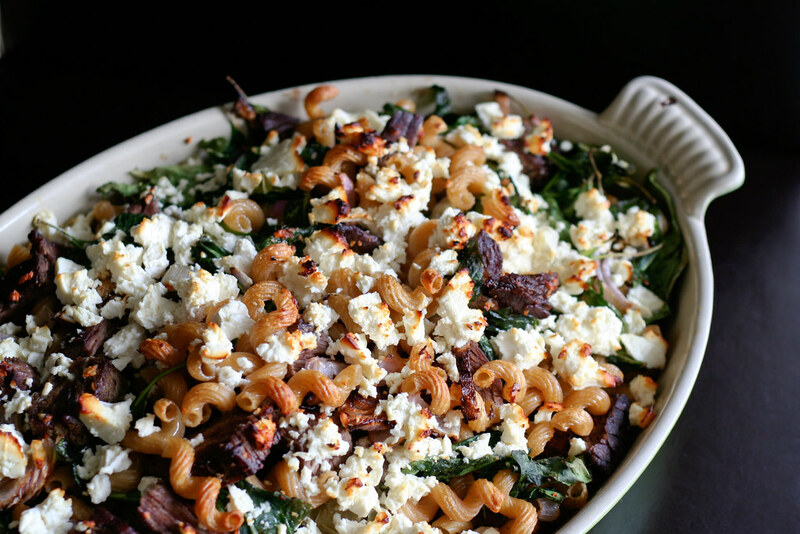 Toss the pasta with the steak, onions, artichoke hearts, feta, spinach and pasta water. Drizzle the top with the olive oil, then transfer to a baking dish. Bake for 15 – 20 minutes or until the top is slightly browned. First time seeing steak and pasta together, but it seems like it’d all work mixed together. Hello! Yum! Am gonna make this one very soon! Beautiful picture too! I love this recipe & have made it twice in the past month. I typically am not a cook so this will be my “safe” recipe for when we have company over. yum yum. I made this tonight after a week of making myself hungry enough for pasta, in copious amounts. THIS TURNED OUT AMAZING!! I followed the recipe almost to a T (I added some Puttanesca sauce instead of the 1/2 cup pasta water, and put some fresh mozzarella cheese into the mix with the feta.) I also had to make it with Gluten-Free noodles (I have Celiac’s)…I will be making this as a go to from now on. Its SO simple and so tasty. You can’t go wrong.